No philosophical idea has captured the imagination of artists more than the sublime. The sublime is an enigmatic experience that involves our taking pleasure in being overwhelmed by sights, sounds, sensations or ideas that are larger, greater or more powerful than us, or otherwise threatening to us. In classical antiquity, and in British and European culture, the sublime has fascinated generations of artists and thinkers in different ways. The sublime has been connected with our experience of everything from nature and art to religion, science, and social and political life. Often philosophers reflect on what artists do. But the sublime is the one major contribution that philosophers have made to art: artists have derived profound inspiration from reflecting on the philosophical concept of the sublime. The sublime emerged as a category of aesthetic appreciation of nature that was distinct from the beautiful and the picturesque. But it can also be distinguished from the tragic and the horrific, as a distinctive way in which aesthetic pleasure can be mingled with an unpleasant experience. In this new course, we shall discover what the sublime is, and how philosophers and artists have grappled with the special aesthetic pleasure that we take in being overwhelmed by the sublime in art and nature. Damien Freeman lectures on ethics and aesthetics at Pembroke College, Cambridge. He is a writer, lawyer and philosopher, who was educated at the University of Sydney and Magdalene College, Cambridge, and has written and edited numerous books and articles on art, aesthetics, biography and law, including Art’s emotions , Roddy’s folly , Mao’s toe and his forthcoming literary memoir, The aunt’s mirrors . He has discussed ethics, aesthetics and politics on various ABC Radio National programs. Together with Derek Matravers, he is editing a collection of essays entitled Figuring out figurative art: contemporary philosophers on contemporary paintings . He is currently writing a book based on his 2013 Art Gallery Society of NSW lecture series, Morality at the Gallery . We begin with an introduction to the experience of the sublime, and the different ways in which it has been understood across the centuries. We find that the sublime is relevant to literature, painting, music and architecture. But how do we make sense of the very different ways in which we can take pleasure in being overwhelmed by these art forms? The sublime in art and nature is introduced through a discussion of works by finalists in the Art Gallery of NSW’s 2013 Wynne Prize. An ancient Greek treatise by Longinus is the first important study of the sublime. Longinus was interested in rhetoric — the science of argument and persuasion. He claims that an orator can overwhelm his audience through the use of high, lofty or grand language, and, in doing so, enable the audience to transcend their ordinary logical thought processes. The idea that sublime literature allows us to transcend ourselves remains important, and can be seen at work in modern political oratory, poetry, and painting, as well as in ancient writing. In particularly, we shall consider the Redfern Speech by Paul Keating, and the way in which his use of sublime language enabled a generation of Australians to transcend their thinking about Aborigines. The rediscovery of Longinus coincided with the era of the grand tour and private travel. Englishmen discovered the Alps, and the special pleasure that they could take in nature, in particular mountains which were not ‘beautiful’ in the sense that a rose or a butterfly is beautiful, but which nevertheless exerted an allure over them. The pleasurable experience of terrible and overwhelming landscapes they called ‘the sublime’. Theories to explain the sublime abounded in Britain and Germany, including the famous treatises of Addison, Burke and Kant. 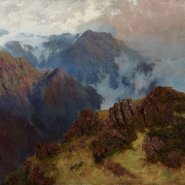 The influence of these theories is seen as far afield as Norwegian and Swiss landscape paintings, and in the Australian landscape paintings of Eugene von Guérard. The sublime truly came into its own in the 19th century. We shall look at a number of different works of art that involve the sublime, and consider the way in which different artists have thought about it. The sublime is found to exert an influence on various art forms within the Western tradition, and often in quite different ways. We shall examine the theorising of artists on the sublime in their art forms, including Wagner on the musical sublime. The sublime has also been influential in thinking about politics and society. We shall consider the most significant theory of the sublime in the 20th century, developed by the French post-modernist Jean-François Lyotard, and examine how the concept was important for the abstract expressionist painters in America, and the way that fascists attempted to recruit the sublime in architecture for their political purposes in Europe. What is the relationship between the aesthetic experience of the sublime and the religious experience of awe that comes with the contemplation of the omnipotence and omni-benevolence traditionally ascribed to the Judaeo-Christian God? What is the relationship between the sublime and the sense of wonder that has so often been critical in major scientific discoveries? Longinus warned that it is very easy to slip from the sublime to the ridiculous. In this lecture, we shall first consider the possibility that we can experience the sublime in Australia today, and then the claim that perhaps we have fallen from the sublime to the ridiculous. The beauty and the terror of the wide brown land has long held an appeal for Australians. The appeal of the Australian landscape is best understood in terms of the sublime. We shall consider how the Australian sublime in nature has influenced Australian artists, such as Fred Williams and John Olsen, and how their experience of the sublime in nature has contributed to a distinctive experience of the sublime in Australian art. This Australian sublime has been influential in the emergence of a distinctive Australian national identity formed by Australians’ relationship to their land. Thus, we shall consider the special contribution that art and aesthetic experience has made to Australian national identity through the Australian sublime. Can we still experience the sublime? Longinus warned that the experience of the sublime could very easily turn into an experience of bathos (‘from the sublime to the ridiculous’). Given that we can fly high above mountains, build skyscrapers and harness nuclear power to unleash unprecedented destruction, is it still possible to feel overwhelmed by the scale and power of nature? Do such developments change the way we feel about the natural world? Does it matter if we can no longer be overwhelmed or take pleasure in being overwhelmed?